No Fenders -Formula 1, IndyCar and A Whole lot more..: Vettel: To Ferrari and Beyond! Yeah, sure the shock of what's become known 'round the world by now is still somewhat surprising... As typical, what's a 'Vurd Botcherer; Err Keyboard Warrior to do on a Friday evening? Thus, trolling around my usual Internetz haunt's one final time in search of any developing news upon Typhoon Phanfone's impact upon Suzuka, the headline from Adam Cooper's F1 Blog threw a total shockwave into Mwah, announcing who's become known here at No Fenders simply as "TWINKIEBOY!" 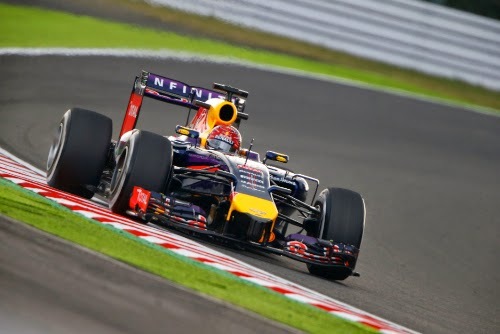 (Seb' Vettel) Was leaving Red Bull Racing effectively at the end of the season! And I'm NO Rocket Scientist, yet I find it funny, Ha-ha; after listening to the "Peacock-lite" (NBCSN) Booth Boyz babble on for nearly the first eleven minutes of the Qualie' broadcast, which I eagerly awaited at 10PM Pacific after having learned of Vettel's decision a mere two-plus hours earlier... Was to hear "Professor" (Steve) Matchett echo my sentiments I'd already fired off in an email noting how Seb' wanted to pull a "Michael" and bring la Scuderia, nee Ferrari back from the Doldrums of being Also-rans, a la Schumacher's Dynasty at Ferrari, ironically a decade ago. But I suppose the signs were already there, as Grizzled Journo' Joe Saward, who likes to brag about his Joe Blogs F1 - The REAL Stories from Inside the F1 Paddock... Had already put the pieces together by noting how Vettel's No. 1 (Chief) Mechanic Kenny Handkammer had bolted from Red Bull (with immediate effect) and most likely would appear in scarlet overalls in Maranello sometime soon. While thy 'Wee Willie Buxom (Will Buxton) went for his own headlines by asking "The Chosen One," (Seb' Vettel) if he was simply running away from Red Bull and Dan Ricciardo? Sebastian Vettel: "I'm Not running away from Anything!" Yet my favourite part of the whole Christian Horner "Brave New World" speech played at the end of the Qualie' show was his quip when pressed by Will Buxton on Seb's landing spot:" "Obviously he's NOT going to Caterham!"